The Mitsubishi Mirage is a top notch sedan by Mitsubishi Motors. Known for its high fuel efficiency, many consumers buy or lease one to save money on fuel. After sitting in a Mirage, consumers quickly realize savings on fuel expenses aren’t the only benefit from driving this hatchback. The cost alone is manageable for the average consumer, and the features included are pretty grand for the price. The 2018 Mitsubishi Mirage comes in three trims – the Mirage ES, SE, and GT. The Mirage has a starting MSRP of $13,395 (plus destination fee), and that is very affordable for a vehicle with an engine paired to a manual 5-speed transmission. For those who prefer automatic transmission, Mitsubishi’s Continuously Variable Transmission (CVT) is only $800 away. Consumers can jump up a trim to get CVT as the standard on the Mirage SE for $16,095 (plus destination fee). That $3,000 price increase may sound like a bit of a jump, but for only $500 anyone can own the high-end 2018 Mitsubishi Mirage GT. Most people make more than this in a year, so the monthly payments on a financed vehicle or lease sounds pretty doable. Let’s talk about these specs so ya’ll know we’re not bluffing. 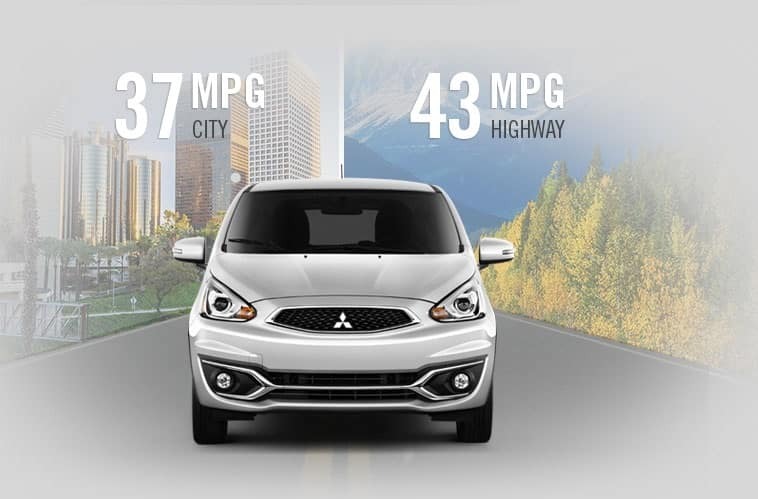 The 2018 Mitsubishi Mirage gets 37 mpg in the city and 43 mpg on the highway. That’s a combined fuel economy of 39 mpg. These numbers also come from engines paired to the CVT. A 5-speed manual transmission knocks the numbers down a bit, but not by much if mostly traveling via the highway (41 mpg). Great fuel economy isn’t the only advantage of the 2018 Mitsubishi Mirage. Everyone gets a touch screen no matter the trim. There’s a 7-inch touch screen on the Mirage ES, and a 6.5-inch smartphone link display on the Mirage SE and GT trims. Everyone also gets a 4-speaker system, Bluetooth wireless technology, steering wheel audio/phone controls (plus voice on the SE and GT), and a rearview camera. To step it up a bit, the Mirage SE and GT trims have Apple CarPlay and Google Android Auto with the smartphone link, as well as automatic climate control for added comfort and convenience. A nice convenience for drivers who are always in a hurry is FAST-Key passive entry, which is offered on the Mirage SE and GT trims . Mitsubishi Motors is notorious for having the best and longest-lasting warranties in the auto market. Unlike the basic 3-year/36,000-mile basic warranty and 5-year/60,000-mile powertrain warranty offered by most automakers, Mitsubishi Motors steps it up and offers a 5-year/60,000-mile basic warranty, a 10-year/100,000-mile powertrain warranty, a 7-year/100,000-mile anti-corrosion warranty. Plus, all Mitsubishi vehicles come with roadside assistance included for 5-years/unlimited miles, so feel free to cancel your “Triple A” (AAA) membership. All of this for about $16k? How can anyone pass up such a deal? Lucky you, we have plenty of 2018 Mitsubishi Mirage models in our inventory.